Another great example, like 1984's room 101, of a novel from which the precept has transcended the work itself and even become part of our language. Everybody knows a Catch 22 situation when they find one - I recall once trying to help someone get a Council Tax exemption on the grounds of severe mental impairment. The thing was that, at the time, if you were able to complete the form then you automatically disqualified yourself. This is parallel to (if less life-threatening than) the situation that Bombardier John Yossarian finds himself in as he tries to get himself sent home before being ordered on yet another flight. Trouble is, if he has the presence of mind to ask for it he’s clearly quite sane, unlike the unhinged Colonel Cathcart, the neurotic Chaplain Tappman and the completely certifiable flight surgeon Doctor Daneeka. Cathcart keeps increasing the number of flights each member of the squadron must undertake and Yossarian’s efforts to remain grounded become ever more desperate. Joseph Heller adapted his novel for theatre in 1971, a decade after the book’s publication, but productions have been few and far between. While the difficulties of bringing the problematic timeline to the stage remain clear, this new production from Northern Stage makes a good fist of it. There are still difficulties in keeping a hold of the narrative threads, but characterful performances from a great cast and fast-paced direction from Rachel Chavkin do manage to hold us with them throughout – no mean feat, as the play runs for over three hours. The cast of nine actors all play multiple roles with the exception of Philip Arditti, who is outstanding in the role of Yossarian. There are times when we think he may have lost his marbles but for the most part he appears the sanest of them all. With huge amounts of dialogue to deliver but the most continuous narrative line, he holds the show together. Impossible to mention them all, but highlights of characterisation have to be Michael Hodgson as Cathcart, David Webber’s Major Major and Doc Daneeka and Geoff Arnold’s Chaplain. Daniel Ainsworth and Victoria Bewick also deliver some strong emotional scenes. The timing is excellent and it needs to be; there are some comic exchanges that could almost come from Sgt. Bilko and even a couple of surreal dance episodes, all of which intercut seamlessly with the darker and more sinister material. The set for the production is by Jon Bausor and lit by Charles Balfour. A cut open shell of a bomber aircraft appears almost to have crash-landed in the corrugated steel hangar that fills the stage and vegetation and debris sprout out from under its wings and fuselage. From a high viewpoint you see the scale and detail of the set, while from stalls level it becomes a more enclosed space. It affords a variety of performing levels, including a representation of a treetop eerie for Yossarian to perch and contemplate – and possibly cool off. This is undeniably a very awkward work to dramatise, but Chavkin’s approach to Heller’s troublesome adaptation makes it work, and it proves to be both a thought provoking and entertaining evening. 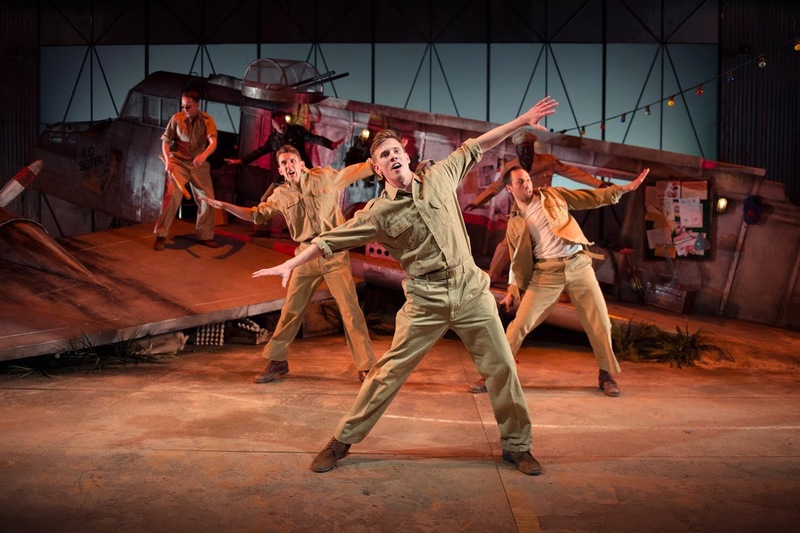 Catch 22 from Northern Stage is at Liverpool Playhouse until Saturday 31st May. The production continues touring via Southampton, Oxford and Derby, closing in Richmond on 28th June. Agreed, Nigel. Heller's anarchical take on war - on the very absurdity of existence - was deftly captured. The ridiculously belligerent and peremptory Colonel Cathcart, along with the (self-defenestrating!) Doc Daneeka were the stand-out performances for me.